Our antique horse brasses were made in England from the 1880s through the 1920s. Some were stamped from sheet brass; others were cast in sand molds. These brasses have been lightly polished by hand on the front, but are unpolished on the back to preserve evidence of honest use on a horse harness. 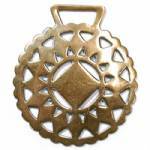 Many antique brasses have rub marks and discoloration on the back, rub marks on the hanging loop, and perhaps some light scratches or marks on the front.